Welcome the latest edition of the Inclusive Growth Bulletin! In this issue, we bring you must-read studies published by the IPC-IG, ranging from a baseline survey report describing the socio-economic situation of potential beneficiaries of a social and behavioural change communication project in Mozambique’s Manica province to a One Pager describing potential synergies between social protection and agricultural interventions. We also bring you news and updates regarding the IPC-IG's policy dialogue and South-South dialogue activities. 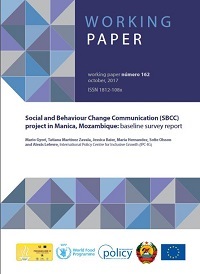 The Working Paper "Social and Behavioural Change Communications (SBCC) project in Manica, Mozambique: baseline survey report" aims to describe the socio-economic situation of potential beneficiaries of the SBCC project in Mozambique’s Manica province. The SBCC programme is part of the larger programme ‘Support to Accelerate Progress towards MDG1 in Mozambique—WFP Sub-Programme’, funded by the European Union and implemented by WFP Mozambique. The report was composed by Mario Gyori, Tatiana Martínez Zavala, Jessica Baier, Maria Hernandez, Sofie Olsson and Alexis Lefevre (IPC-IG). It is available in English, and an accompanying One Pager, written by Mario Gyori and Tatiana Martínez Zavala, is available in English, French, Portuguese and Spanish. In the One Pager "Recognition of care work: the case of the Expanded Public Works Programme in South Africa", Charlotte Bilo (IPC-IG) analyses this programme created in 2004 by the government to tackle the continued growth in unemployment. The programme offers short-term employment and on-the-job training in four different sectors: infrastructure; economics; the environment and culture; and social. This publication is available in English, French, Portuguese, and Spanish. In the One Pager "Bolsa Família and ‘Progresa/Oportunidades/Prospera: consensual reforms? ", Carla Tomazini (University of Versailles Saint-Quentin-en-Yvelines) evaluates the difference in the design and purpose of the two pioneering Mexican and Brazilian cash transfer programmes (CCTs), which remain the two largest and best-known social assistance programmes in the region. This publication is also available in English, French, Portuguese, and Spanish. In the One Pager "Targeting social protection and agricultural interventions: potential for synergies", authors Cristina Cirillo (University of Florence and University of Trento), Mario Gyori, (IPC-IG and London School of Economics), and Fábio Veras Soares (IPC-IG) explain how an alignment of the targeting mechanisms of social protection programmes can help boost programme coordination and coherence, and potentially build synergies to reinforce their impacts. This publication is also available in English, French, Portuguese, and Spanish. 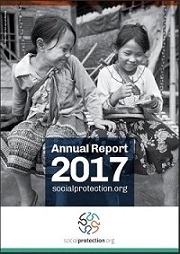 We are also glad to share socialprotection.org's 2017 Annual Report, which showcases the achievements of the online platform and charts its future directions. The platform is funded by the Australian Department of Foreign Affairs and Trade (DFAT), and the Deutsche Gesellschaft für Internationale Zusammenarbeit (GIZ),and is hosted by the IPC-IG. See our full list of publications here. The Centre will undertake two new research projects in partnership the World Food Programme (WFP) in Mozambique, under the scope of the WFP's MDG1 initiative. The first project will evaluate the coverage and benefit incidence of the WFP's interventions to accelerate food fortification of staple foods in the country. The IPC-IG team will conduct a quantitative assessment of the coverage to evaluate which socioeconomic groups benefit from the fortification of wheat flour, maize flour, vegetable oil, and sugar. The second project will evaluate the impact of the WFP's interventions to promote and improve smallholder farmers’ access to markets in Mozambique. The Centre will conduct quantitative and qualitative impact evaluations of the project's initiatives, among other activities. Our Senior Project Officer, Mariana Balboni is participating in the TRANSFORM Training of Trainers (ToT) workshop in Lusaka, Zambia, from 16 to 27 October. During the event, she will present the TRANSFORM e-course project and record the mini-lectures that will be part of the course. The major aim of this course is to train African regional trainers with the skills and motivation to contribute to the further development of the TRANSFORM Social Protection Learning Package and its delivery in the African region. TRANSFORM is an innovative learning package on the administration of national social protection floors in Africa. The prime objective of TRANSFORM is to build critical thinking and capacities of policy makers and practitioners at national and local levels to improve the design, effectiveness and efficiency of social protection systems. 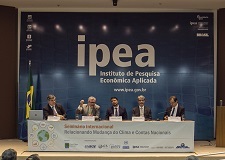 The IPC-IG, Ipea, the Institute Climate and Society (ICS) and the Brazilian Government organised the International Seminar on Climate Change and National Accounts, which aimed to discuss the challenges of including measurements of GHG emissions in the System of National Accounts (SNA). During the event held in Brasilia, on 17 October, renowned Brazilian and foreign experts also shared insights into how national accounts can be used and adapted to monitor national policy responses to climate change, such as programmes designed to mitigate GHG emissions, among other issues. Read the article. Child poverty, social exclusion and how social protection can help children enjoy basic living standards were the main topics of the Sub-Regional Conference on Social Protection for Children, organized by UNICEF in Sarajevo, Bosnia and Herzegovina, from 16 to 18 October. 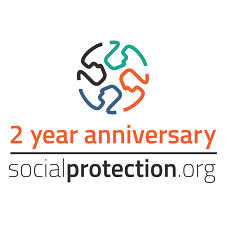 The event gathered high-level decision makers, social protection technical staff and policy influencers from the region to discuss innovation in social protection, exchange experiences and promote co-operation. IPC-IG's Senior Research Coordinator, Fábio Veras, was the keynote speaker of the session "Linking cash transfers and social services”. See his presentation here. Dr. Veras was also a resource person at the work group on social support and care services. Our colleagues and partners at socialprotection.org will host the webinar "Benefit Package Design for Universal Health Care: A framework for systematic decision-making on pharmaceuticals, country experiences and global best practices", on 26 October. Organised by Global Alliances for Social Protection and the German Corporation for Development Cooperation (Deutsche Gesellschaft für Internationale Zusammenarbeit—GIZ), this webinar will discuss issues related to systematic decision-making for universal health coverage. The presenter will be Ms. Ioana Ursu, PharmMD, former Secretary of State in Romania and Director of Mapping Health Ltd. Ms. Viktoria Rabovskaja, GIZ Global Alliances for Social Protection, will moderate the session. Free registration is available here. Speaking of socialprotection.org, the IPC-IG is hiring a Knowledge Management Assistant to join the online platform's team. The deadline for application is 31 October. You can find more information about this opportunity here. Help us spread the word! The IPC-IG participated in an inception mission organized by UNICEF in Tunis, Tunisia, from 16 to 23 September, as part of ongoing discussions on the design of cash transfers to children. The pilot project, to be implemented in 2018, will consist of a universal cash transfer to all children aged up to 17 years old, who live in the 10 poorest delegations of the country. This transfer will build on already existing interventions such as the family allowance for formal sector workers as well as the school allowance top-up (PPAS) for beneficiaries of Tunisia’s targeted social assistance cash transfer (PNAFN), who are guardians of school-age children. During the mission, IPC-IG’s Senior Research Coordinator, Fabio Veras and Sergei Soares, Ipea Researcher and IPC-IG Research Associate, met with officials from the Tunisian Ministry of Social Affairs and Statistics Office, as well as development partners such as UNICEF, the World Bank and the European Union. In the long run, the intent is to scale up the pilot to benefit all Tunisian children. Various designs for universal child grants were discussed. The IPC-IG is accepting applications from outstanding students for its 2017 Internship Programme. We are looking for graduate-level students who are passionate about international development and who believe that inclusive growth, the dissemination of knowledge and social development have the power to transform societies. Requirements and information on how to apply are available here. If you know someone who would be interested in joining the programme, help us spread the word. And watch the video featuring our interns!